achieve quality, reliability, durability, costs, etc. that are superior to their competition in the market. The methods of Robust Design improve many of those attributes. The benefits are greater when applied during the development of new technical concepts and in the early phases of product development. The earlier that quality and reliability can be achieved, the less vulnerable is the project to the higher costs and delays caused by late design changes. The concept of something being “robust” is familiar. It implies adjectives such as tough, rugged, durable, long lived, and stable. Our engineering definitions are similar although more specific and mea­surable. A system that is more robust is less sensitive to the sources of variability in its performance. Robustness is the ability of a design to deliver its intended function with quality characteristics that are aligned with their requirements (“on-target”) and that are stable under stressful conditions (“minimum variability”). You can measure functional variations in experiments, you can anticipate failures without actually experiencing them. You can use experimental stresses to force variations to occur deliberately under laboratory conditions, you can find more problems faster and prove their solutions to be better. You can identify those critical design parameters that reduce the vulnerabil­ity to stresses, you can devise solutions that are more effective at increasing reliability and durabil­ity. Experiments map the relationships among design parameters, stresses, and performance, data are transformed into reusable knowledge. Decisions can be driven by this knowledge. Critical design parameters are successful without tightening their manufacturing tolerances or increasing their material costs, then increased manufacturing costs are avoided. The diagram below illustrates elements that are fundamental to critical parameter development. The basic function is part of a system of integrated functions that comprise the product. It has an input signal from a linked function that may be static or dynamic and may have variability. The basic function transforms an input signal into an output response. The output response is directly related to the physics of the basic function. It has a requirement derived from the full system product requirements. There are stressful factors not controlled by the design, but that cause undesirable variations in the functional response of the design. The function diagram illustrates those parameters that affect the mean and variations in the output response of a function. The performance of a product is subjected to stresses from three fundamental sources. Among Products in Production: Degrading factors in manufacturing, assembly, distribution, installation and service contribute to differences among units of the same product, reducing yields and out-of-box quality. Internal to each Product: Factors internal to the product deteriorate performance during its use. Damaging interactions can be mapped among components and subsystems to determine how to reduce their effects. External in the Use of the Product: Factors external to the product can deteriorate its performance due to the environments of its shipping, handling, storage, installation, use, and service. The design of ways to introduce the most significant stresses, or their surrogates, into product development, analytically, empirically, or both. What does that mean? Counting failures and their frequency is not very useful for engineering. When a failure occurs, it tells you almost nothing about its root cause or what to do to correct it. However, variations can be measured in those functional responses that eventually lead to a failure. Design improvements can focus then on reducing the variations. The methods of Robust Design provide a simple but powerful set of tools for problem prevention. They build upon traditional development methods. The principles have many nuances to appreciate. Better Concepts: Critical parameter development identifies and specifies those design parameters that are most effective at controlling the mean and variability of the output response. If they cannot be found, the design concept is flawed and will never be optimized. Determining that very early in the development process enables a better concept to be substituted. Technical Concept Development: If a design concept and its enabling technologies can be developed to be robust prior to product development, the cycle time and risks for product development can be reduced. Superior Solution: The methods emphasize the achievement of a better solution. During product development it is not essential to have a deep understanding of the scientific relationships among root causes and functional misbehaviors. The objective is to improve the design and move on to the next problem. Failure Modes Excited Deliberately: By deliberately introducing stressful conditions, measurable variations in a function’s output response enable problems to be found sooner and solutions proven to be better. 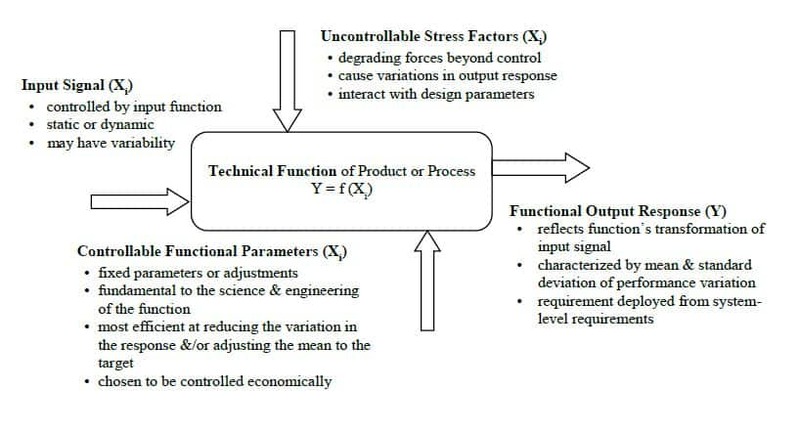 Stressful Conditions: Robust Design is not concerned about a test condition being an accurate reflection of degrading forces expected in customers’ applications. As long as the stresses are severe enough to force variations, solutions developed to be less vulnerable to those stresses should be less vulnerable to whatever stresses are experienced in customers’ applications. Likewise, if your product is less vulnerable to stresses than competitive products under the same conditions, it can be expected to be more stable in the market. Designed Experiments: Fractional factorial experiments incorporating stressful conditions enable much to be learned with fewer test runs. Orthogonal Arrays: Orthogonal arrays are often the experiment design of choice. They are Resolution III experiments in which main effects are aliased with two way interactions. Response Surface Designs: Response surface designs are available as central composite, Box-Behnken, and optimal designs. They can be used to develop empirical models having un-aliased two way interactions. Subsystem Interfaces: A desired attribute of a product’s architecture is the robustness of the interfaces among its subsystems. To the extent that there are no stressful interactions, flawed subsystems can be replaced by superior ones without jeopardizing the system integration. To the extent that the responsibilities of a work group are aligned to subsystems, the risks will be within the work of the team rather than between teams. Additivity: A design whose critical parameters are either independent or interact constructively is much easier to implement in production. The effects of the parameters add to each other, rather than counteract their effects on the response. Smaller experiments can be designed since interactions can be neglected. This additivity allows one parameter to be changed without requiring a companion change to another. If additivity is seriously lacking, the cause tends to be in the choices of control parameters and/or responses. Worst of all, the architecture of the concept may be flawed and in need of redesign. Unknown Relationships Explored: In many cases the relationships among controllable parameters, stress factors, and the functional response are not known well. The methods of Robust Design are well suited to explore the unknown behaviors, guided by good engineering judgment about potential cause and effect relationships. Predictive Empirical Model: If interactions in a system are small compared to the main effects, the analysis of the data from an orthogonal array experiment can provide an efficient empirical model. The objective of this model is not to predict reliability. Its construct is focused on selecting the best set points for those parameters it chooses to control and on predicting the resulting performance and variability under the test conditions. Parametric Relationships: The strategy to reduce the sensitivity of responses depends on selecting design parameters that are responsive to stresses while having non-linearity relationships with the output response. By choosing set points for the critical parameters where the functional response is less sensitive to the stresses, the variability in the output response is reduced. Parameters that have linear relationships with the output response can be effective adjustments. Critical Parameter Management: As product designs are developed and parameters specified, it is essential that configuration control, design change management, and design release to manufacturing be formalized with a disciplined product data management system. Output responses of the function and their variations to be measured. The specification of those critical design parameters found to have the most influence over the performance and robustness of the product. More predictable and reduced development cycle times, with related reductions in development costs. Product designs that are more robust than their competitors under the same stressful laboratory conditions can be expected to have higher reliability in the market environment. Critical parameter development is an important strategy for problem prevention. The knowledge developed about the behaviors enables late problem solving to be more deliberate and efficient. The objective is to achieve product performance that is “on-target with minimum variability” under stressful conditions. What successes with Robust Design can you share? How well have the benefits been experienced?